The blurry photograph posted on Facebook was striking and unsettling, the Patterson-Gimlin film of car spots. A cloudy day. A rain-darkened highway. And like Bigfoot streaking through the frame, a Ford F-150-Mustang fastback mashup. We had to know more. It might look like a one-off build commissioned by the truck's brave and touched owner, destined to become legend on his local roads and beyond. 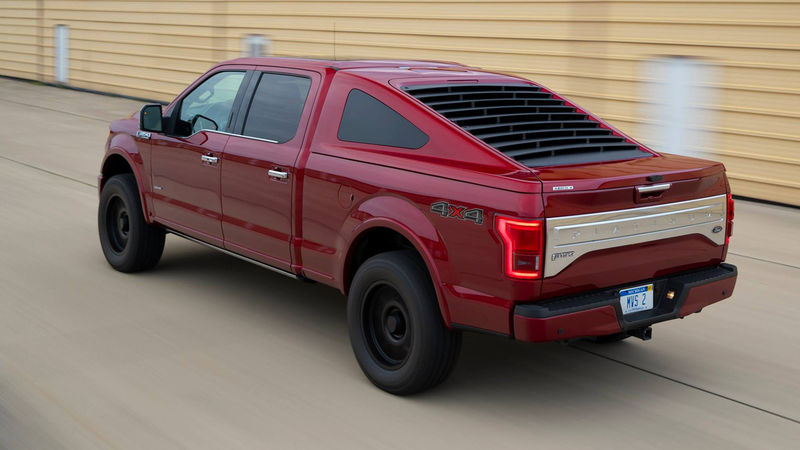 But as we found out, that tapered, louvered roofline—styled after the 1969 Ford Mustang Mach 1—is actually a new production bed cap called the Aero X, and its creators at Michigan Vehicle Solutions are hoping to make fastback pickup trucks the next big thing. The company is one of those all-purpose automotive outfits that does everything from custom part installations to complete restorations and pretty much everything in between. What it's never been is a manufacturer, which hasn't stopped CEO Rich Oliver from pursuing his vision for a fastback bed cap. "We looked around and saw the lack of innovation out there," Oliver tells The Drive. "It's time for a different thing from our grandfathers' bed caps. The flat tonneau, the shoebox, all that has run its course." The Aero X is nothing if not different. 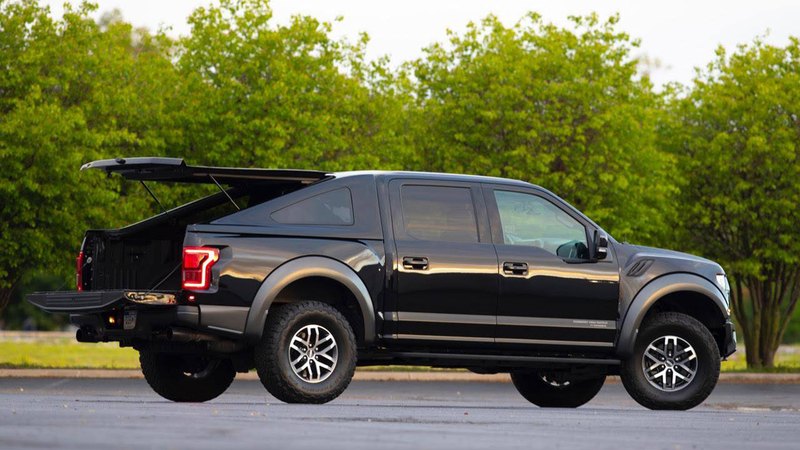 Currently available for the 2015+ Ford F-150 in 5 1/2-foot and 6 1/2-foot lengths, the 260-pound fiberglass topper adds a Mustang-inspired sloping roofline and louvered rear window, a lockable clamshell opening for convenient access, and extra options like a built-in sound system. It attaches using the industry-standard bed clamps like any other bed cap, no modifications required, and it starts at $3,995. It's true that out of any vehicle, the profile of a pickup truck has changed the least over the last century—there's either a box or a bed behind the cab. But it's also true that of any vehicle, the way we use pickup trucks has probably changed the most over that time, going from work tools to everyday drivers. So, okay, maybe there is room to do something different, especially since the weatherproof space essentially turns the bed into a giant trunk. But why the Mustang fastback? Oliver says there was no real market research, no business case other than the billions of dollars customers spend in the truck aftermarket every year. (The Ford F-150's status as America's best-selling truck didn't hurt, either.) After commissioning a few renderings and nailing down a final design, he committed to producing the Aero X. "It's been a 'if you build it, they will come' kind of process," he says. The concept of a sloped, aerodynamically-efficient bed cap for a pickup isn't entirely new, but until now they've been the provenance of design studios, homebrew eco-modders, and the occasional rally raid truck. By contrast, the production Aero X was born from a form-over-function approach—that is, it looks the way it does because Oliver thought it was cool. The minor boost in fuel economy provided by that sleeker profile, which MVS hasn't formally tested, is incidental to the style. 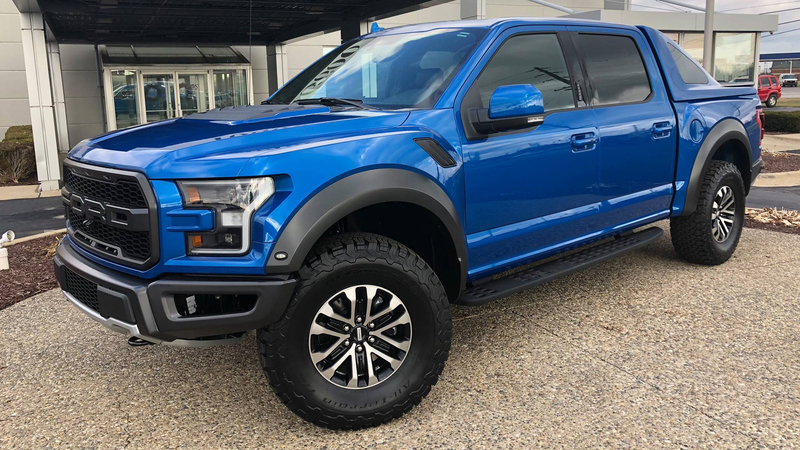 Neither the design nor construction were as simple as chopping fastbacks off Mustangs and plopping them onto the F-150, of course. Program manager Jim Thompson tells us the team played around with the angle of the slope and how much it should taper in when viewed from behind before settling on the final look—which Oliver admits can have a polarizing effect on people. We think it looks surprisingly good with the decal package on the truck in the Facebook photo; slightly less so on the trucks seen here. If you're going to go all out, go all out. 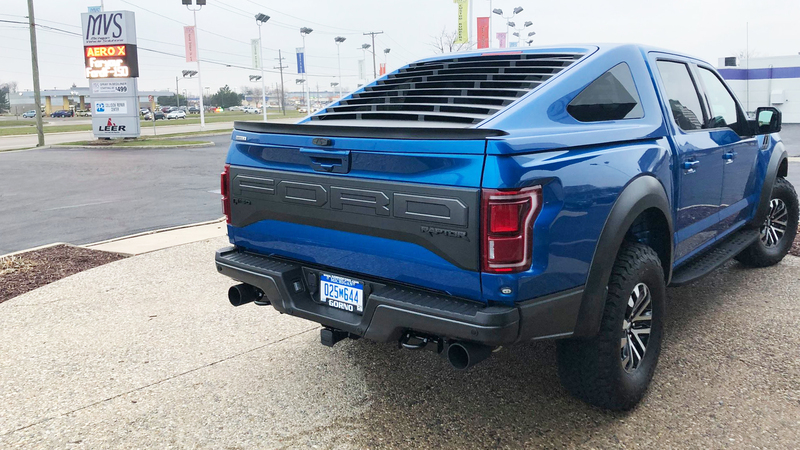 There are a few alpha issues we can spot right away, like how the topper looks ill-fitting when placed over the Ford Raptor's wide fenders. The design also feels a little more cohesive with the short bed. We'd love to see one backing a single cab as well. For America's roads to be ruled by fastback pickups, though, MVS will need an OEM or large aftermarket partner to help with production and installation. As it stands now, the company can only make between 8 and 10 Aero Xs per week at its facility, and fast, efficient shipping remains a hurdle. A Ford representative who recently swung by for a meeting had one big question, according to Oliver: "If I need 10,000 this week, who's going to build them?" There's no simple answer yet. As to the question of who's going to buy them, Oliver claims the company gets at least several calls a day from prospective owners since it showed the Aero X at SEMA last year. So MVS is focused on meeting current demand, building up inventory, and further refining the feature set to lower costs. But the ultimate goal, Oliver says, is to develop fastback bed caps for every pickup on the market. Even if you think this entire concept is ridiculous, you have to admit it's easy to get lost in broadening the idea. What would a Nissan Frontier look like with a 300ZX bed cover? How about a Chevy Silverado combined with an 80's Camaro? Why shouldn't this be a thing? Accept the premise, and the possibilities are endless. And if you just don't get it, well, it's a free country. But should you see an oddly-shaped truck bounding down the road one day, there and gone in a flash, know this—your eyes aren't deceiving you. Fastback pickups are real. Our biggest complaints about this short cab, off-road-focused version of the Ram 1500? It's too small inside...and it could be better on road.